My alter-ego is a geophysicist because, somewhere along the line, I decided I didn’t want to be sitting at a desk all day. I was under the impression that because geologists are outside all day, geophysicists must be, too. There is some truth to that argument, but it turns out to not be applicable to the types of geophysics in which I am interested. This particular friend, along with several mutual friends, decided to spend a weekend camping…only they wanted to do it in an igloo. They had an Icebox igloo maker. (No, I’m not getting kickbacks from the company.) My friends did a practice run in a park one weekend. Then they attempted construction of the full igloo with the intention of camping in it. Sadly, they were unable to finish it, leaving them to snow camp in an incomplete shelter. A big part of the problem with building igloos is that, unless you happen to have a boatload of fairly dense snow in the immediate area, you have to increase the area from which you’re gathering snow. As you do this, it increases the amount of time to set each individual block. You also have to take into account fatigue. Building igloos is fairly difficult work. After this experience, the friend wanted me to write a program to see if I could calculate how long it would take to build a complete igloo. The igloo maker is basically a box on a stick. One end of the stick is tacked to the ground. There is an articulating joint so that you can move the stick in essentially any direction. The box is filled with snow, to make a block, and then shifted to the next position. This is repeated over and over. At the beginning, you’re also supposed to build a ramp, so the bottom edge flows continuously from one row to the next. In essence, you’re making a helix that’s tapering. The actual shape is a catenary. While I started out with idea of recreating this shape, I realized I was only getting one milkshake out of the deal, so I quickly opted to make some simplifying assumptions. Rather than using a helix-type parameterization, I opted to model five rows of simple blocks. I calculated the number of blocks for each row. Then I assumed a starting quantity for how long it would take to make a block, and increased the amount of time for each subsequent block by a fixed amount. I could alter both of these values to get a better estimate. I wrote the program this way and came up with some pretty plots. However, I realized I had very little validation of the algorithm. Yes, I knew approximately how long it took, in total, to build the first five rows. However, I would prefer some more specific data. My plan is therefore to join another trip as an observer and take careful records to determine how long it really does take to make each block. And, as an observer, I can’t participate myself in building the igloo because that, of course, will alter the results. Two guys in the arctic. Two knives. Igloo complete in 90 minutes. 1 – These guys actually know what they’re doing. 2 – They have optimal snow conditions. Oh, I didn’t forget. I think this video provides you with a realistic lower bound for your model. Interesting, they’re using a totally different method to what I would have expected and the manual that comes with the igloo maker wasn’t easy to read! However if I understand how its supposed to work (and despite commonly held beliefs we don’t have much familiarity with proper snow in the UK) I did some back of cigarette packet number crunching for an 8ft igloo. I worked on total volume of snow in the walls with an exponential increase in time to move a cubic foot of snow of 1% for every 10 cubic foot shifted, which gives me about 4.4 hours to complete based on my initial conditions. I’m pretty happy with that as it *seems* a realistic ballpark to me but you’ll have to report back on how long it actually takes, which may be a perfect time to do a blog on battery types & requirements for heated snow clothing! I’d actually be interested to look at how the time taken could be optimised based on different numbers of people constructing and the human factors involved such as whether the performance lost due to fatigue is worse due to the cold or better due to the desire to get out from the cold! It’s an interesting problem, isn’t it! Lots of complicating factors. My friends were building a 10 ft. igloo, and it took them (if I recall correctly, it’s been a while) about 6-8 hours. They also had less snow than they anticipated, which probably made it more difficult. 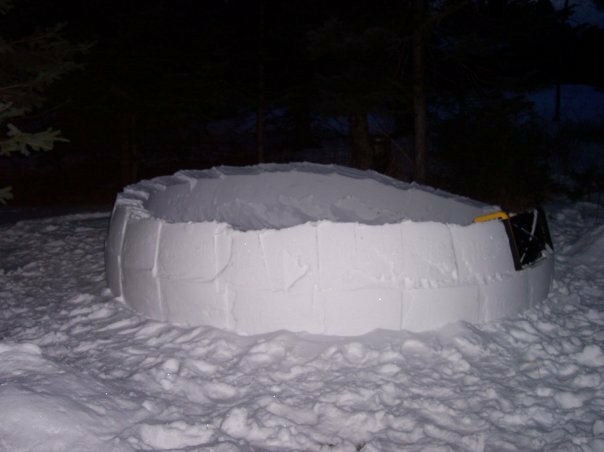 The nine foot igloo takes about 75 blocks to build and uses 4.5 cubic yards of snow. The fastest a team of three of us have ever built the nine footer is one hour and forty minutes. With bad snow conditions it takes us two hours and forty minutes. New customers come in anywhere between two hours and eleven hours, usually around 4.5 hours. To be certain it is understood, I am the inventor.